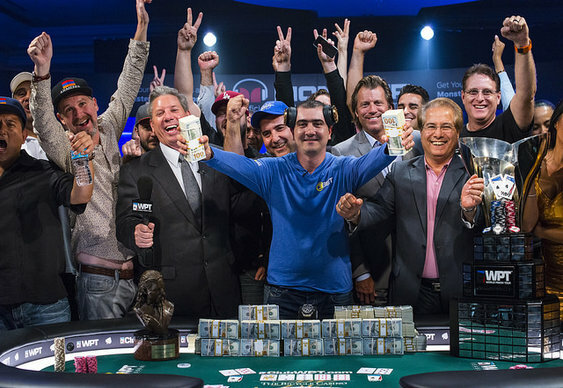 The opening leg of the new World Poker Tour season is in the book with Harry Arutyanyan taking the Legends of Poker title. Arutyanyan topped a field of 593 entrants to pocket a first prize of $576,369 after five days of action at the Bicycle Club. Mike Eskandari was the man to beat heading into the six-man final table and he consolidated that advantage early on by eliminating Jeremy Kottler in sixth. The next eliminations came 23 hands later and put Arutyanyan right back into contention. Neither Tyler Cornell's KhJs nor Taylor McFarland's QcQs could hold against Arutyanyan's Ad10s. Tyler Kenney's challenge stalled in third when his short-stacked four-bet shove with A2 was looked up by Eskandari who was holding sevens. The pocket pair held to give Eskandari a healthy lead heading into heads up play with Arutyanyan. Despite facing a four-to-one deficit, Arutyanyan ground his way back into the match by winning a string of small pots. He then took control, doubling up with 10-8 on a 10-8-A board as Eskandari tabled A7. It's fair to say that A7 isn't Eskandari's favourite hand as it proved his eventual downfall. He moved all in and was called by Arutyanyan who was holding A8. Despite plenty of split pot possibilities, the 8 played to give Arutyanyan the title and his biggest score to date.